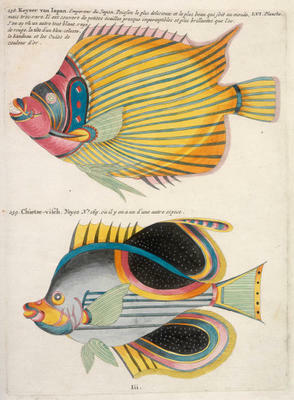 These surreal images come from a book, Fishes, crayfishes, and crabs, of diverse colours and extraordinary form, that are found around the islands of the Moluccas and on the coasts of the southern lands (translated from french and truncated) originally published in 1719 by Louis Renard, and it was claimed it took 30 years to compile. The 460 engravings on 100 copper plates were later hand coloured and a 2nd edition of the book was published in Amsterdam in 1754. Renard himself, comes across as a rather curious character..
"As well as spending some seventeen years as a publisher and bookdealer, Renard (c.1678-1746) also sold medicines, brokered English bonds and, more intriguingly, acted as a spy for the British Crown, being employed by Queen Anne, George I and George II. In this capacity he helped guarantee the Protestant succession to the throne by preventing stores from reaching the 'Old Pretender' James Stuart. These supposedly clandestine activities were not particularly secret. In fact, Renard used his status as an 'agent' to help advertise his books. 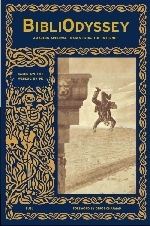 This particular work is actually dedicated to George I while the title-page describes the publisher as 'Louis Renard, Agent de Sa Majesté Britannique'." These embellished images are said to mark an important milestone in the depiction of marine creatures. Much of the exaggeration may have crept in from repeated copying and colouring from verbal directions but, perhaps the authority on the subject, Theodore Pietsch, considers that the patterns and key character features present allow association of each drawing with a real creature. Most of the information here (indeed, on the internet it seems) derives from this 1 page Special Collections exhibit at Glasgow University Library - there are a few different plates on display here. The engravings (many done from secondary source drawings) are meant to depict creatures from the East Indes. There is no text, save for the commentary next to each animal. Not suprisingly there are many commercial representations of Renaud's beasts around in such forms as posters and address books &c. I also find it interesting that the original title includes the words Terres Australes - a geographic location descriptor, not name of course (interesting just because those of us who live in Oz hear variations on the terra australis nomenclature all our lives and we associate it with the name Australia, so an early 18th century reference is just .... strange or something). The pattern on the first fish is reminiscent of a fifties dish. Amazing post. Incredible images made better by your explanation of their origins and cultural context. Your blog is filled with jewels. I'm enjoying the light show. This was a serendipititious find - find of the week. The luck part comes I think because (not certain, but I think) that book is just going on display at NSW State Library so my guess is they digitized these images in concert. boynton I feel like I see that pastel decoration everywhere, not just the 50s. In fact I think maybe in the 90s it was de rigeur for seafood restaurants to have such china (not overly a fan myself - of the washed pastel look anyway). Thanks cruelanimal. There's some fine eyecandy out there!